EDMONTON — The Ottawa Senators played the kind of game Saturday that head coach Marc Crawford enjoys watching. 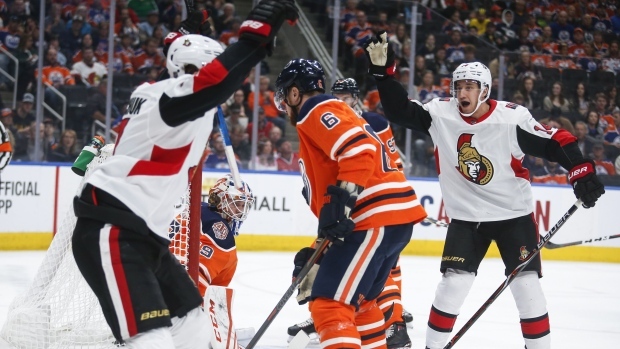 Brady Tkachuk scored his second of the game 2:09 into overtime as the Senators put a crimp in Edmonton's already slim playoff hopes with a 4-3 victory over the Oilers. Bobby Ryan and Brian Gibbons also scored for the last-place Senators (26-43-6), who snapped a two-game losing streak. "It was really satisfying," said Crawford. "You need success in order to keep the guys focused in on doing the right things. I thought we played a really good game, it was one of the most complete games that we've played. Senators goalie Craig Anderson made 26 saves to capture his first win since Dec. 21, snapping a personal streak of 14 straight losses in net. "It's been a long-time coming," he said. "Personally it's been a tough stretch, obviously, to be close without (being) able to get there. Tonight we were able to get there and finalize it and get the win and it's just a great feeling to have." Alex Chiasson, Connor McDavid and Colby Cave replied for the Oilers (33-34-8), who have lost three of their last four. Edmonton knotted the game four minutes later when Chiasson was sent in on a breakaway and beat Anderson with a backhand shot. Ottawa regained the lead with another first-period power-play goal as Ryan deflected a shot home from the doorstep. The Senators once again surged ahead seven-and-a-half minutes into the third after a terrific pass from Magnus Paajarvi set up a goal by Gibbons. But Edmonton came back just 66 seconds later on a goal by Cave to eventually send the game to extra time. Both teams are off until Tuesday, when the Oilers host the Los Angeles Kings and the Senators return home to face the Buffalo Sabres. Notes: Both teams had their share of controversies this week with Oilers CEO Bob Nicholson publicly calling out the play of goalless forward Tobias Rieder at a season ticket holder's breakfast and embattled Senators owner Eugene Melnyk making disparaging comments on a radio show about Ottawa's fans, mayor and media, as well as the rebuild of the rival Toronto Maple Leafs… It was the second and final meeting between the two teams, with Edmonton winning the previous encounter 4-2 on Feb. 28... Senators defenceman Thomas Chabot returned to the lineup after missing four games with a broken toe… Oilers defenceman Andrej Sekera played his 700th NHL game.